One of the few songs I've tabbed on my own so i'm not sure if they're exact, get back to me if you figure out a better way. That last chord is especially weird and possibly wrong. Are there any tabs for Dragon? You can see most of what he plays in the Pinball session video but I'm really bad at guitar, I'd appreciate it if someone would tab it out or at least post the basic chords. 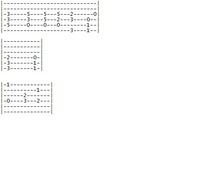 Yeah I used to play it with the 2nd(B) string open because some recordings it sounds like he has it open, but i felt that chord i posted sounds better in the end. idk i'm no musically oriented person so i'm sure someone else has some concrete chords for it, they work for me though. Does anyone here know the tab for Anacortes has a secret Love, the first Instrumental track from the Glow pt. 2 or Samurai Sword? Goodbye Hope: Here's a starter, can anyone finish it off for me? can't figure out the rest. any ideas? any help with Cold Mountain's Song #286? What happened to the google page that VMWhelan had supplied that contained just about every Elverum tab you would ever need? I regret not taking screenshots of that, i've forgotten a lot of them and would love to get them down again. Hey sleepdyhollow the page is still up!